Occidental's women are robbed — literally — before a lopsided loss to Chapman. 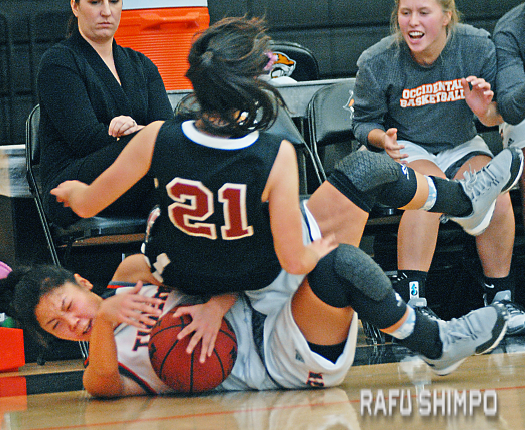 If Occidental’s women’s basketball team seemed a little weary last Tuesday night, it’s certainly understandable. For the second time in as many weeks, the Tigers were the victims of theft. Someone apparently managed to get into their locked dressing room and steal items that included wallets and electronic items. A similar misfortune befell the team before their Jan. 2 game at Redlands, resulting in a reported loss of around $15,000. So when the Lady Tigers took to their home floor Jan. 12 against Chapman, the stress was fairly evident. The Panthers were firing on all cylinders and deployed a stifling defensive press, in the end running a way with a 20-point win, 67-47. “It’s been a really bad day,” was the only comment from Oxy head coach Anahit Aladzhanyan. She and her players had to deal with filing police reports and were in no mood to discuss a basketball game. There was a game, however, and one Oxy would probably prefer to forget. After seeing Chapman post 24 points and jump out to a double-digit lead by the end of the first quarter, the Tigers regrouped and tightened up on defense in the second frame. Sophomore Midori McElwee scored eight of her 11 points and junior guard Erin Matsumoto netted all of her six in the first half and Oxy (5-9) had narrowed the score to 38-30 by halftime. Chapman (8-5) emerged from the break with an answer, however, and the answer began with D. The Panthers allowed Oxy a mere six points in the third quarter, four of which came in the final two minutes of the period. By the midway point of the fourth, Chapman coach Carol Jue had pulled most of her starters and let the bench finish up the game. Jaime Hum-Nishikado was one of the hot hands for Chapman, finishing the night with 15 points, including four three-pointers. Lauren Takemoto and Lauren Sato each scored five and frosh guard Katelyn Serizawa was solid with six assists to go along with two points. 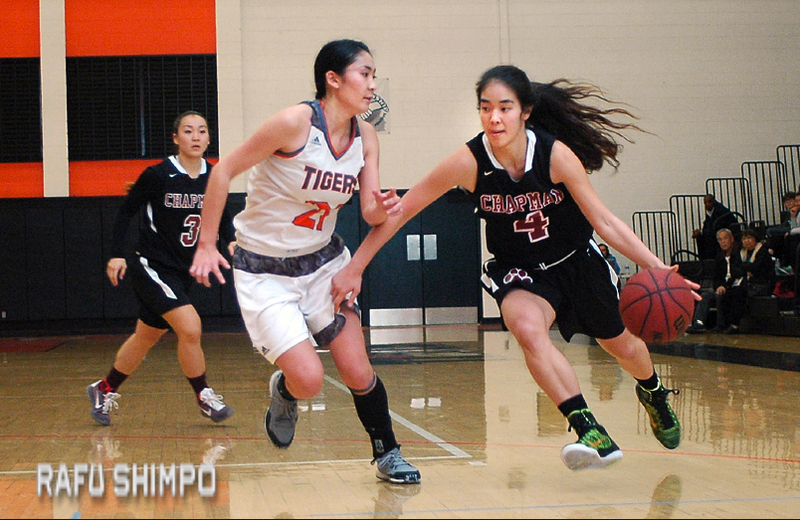 Dru Ishibashi added five points and two steals for Oxy. Serizawa, who played North Torrance under head coach and Chapman alum Lauren Kamiyama, said the transition to the Panthers’ style of play has been a smooth one. “The women at this level are a lot stronger, but playing for coach Lauren, who learned from [Coach Jue] I think has helped,” Serizawa said. Sato agreed that the Chapman pedigree has helped Serizawa tremendously. Occidental was scheduled to face Whittier today, while Chapman was in action Jan. 14 at La Verne.